Few words are spoken: "say what you mean, mean what you say". Words sung are almost whispered - apologies and pleas. There's a trumpeter on loan from Simply Red, viola for that classic chamber-muzak feeling, and Bruce Mitchell, who keeps time in comic, slicked-back hair 'cool' manner. 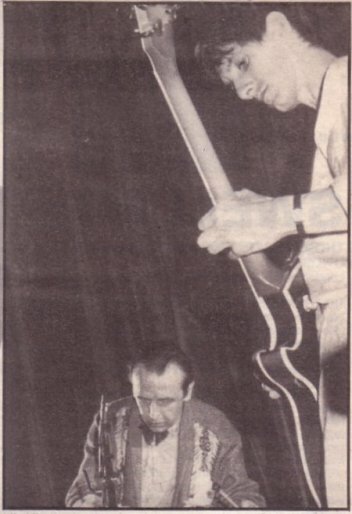 Vini Reilly's music has always take stock of 'the passing of time' - tonight, the past plugs up '85's potholes: a few ancient guitar phrases recur, whilst the sparse drum and guitar opening pieces exorcise the first four DC LPs. Reilly's electro-piano licks are a treat: circular riffs and chords dripping with that Lee Perry-patented 'underwater' effect. Mr DC's six-stringing also defies hyperbole - the very definition of 'pure'. Words like: pastoral, 'Englishness', melancholy, pretty, trance-inducing, can still be chucked around whilst assessing DC85. Sadly, 'space', 'solitude', and 'dub' have ceased to exist. At the mercy of Fixx-loving PA mixers; this isn't an evening for reverb, echo or special effects - a real shame, as (theoretically) the Mad Professor or Oz (practical) would have infused some sense of 'space' into the proceedings (if only Factory had arranged these things...). Some moments adhere to memory: 'Silence', a propulsive 'Beggar', 'Dream Of A Child', a new song - but there's so much drifting / floating between these points. The communal backslapping of 'democratic playing' works against Durutti Column: tonight's violinist is strapped to convention, Sir Trumpet veers too close to cut-price pseudo-jazz for comfort, and the pre-programmed DMX beats are surprisingly insipid ('Without Mercy', part two). What's needed isn't a return to basics - one shouldn't retrace steps - no, just a more solitary 'Duruttivision' - perhaps cajoled out of that Fairlight Factory have just acquired. 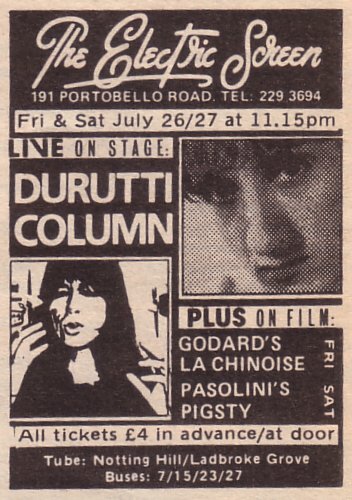 A slightly unfavourable review then but with Durutti Column on the bill with arthouse cinema what more could you want.